As their final paper in HIS230L World War I, students write a memoir of their J-term travels in Europe – responding to readings and sites and drawing on the letters home and other reflections they recorded in a course journal. Here’s one such memoir, by Justin Brecheisen ’19, a double-major in History and Business and one of our departmental teaching assistants. It was with a contrasting combination of apprehension and anticipation that I strode into the airport on the afternoon of our flight across the Atlantic. The anticipation was a result of months of planning, working, and researching to make the trip a reality. I had dropped the majority of my summer savings on the trip payments and spent time planning out every item and all the information I would need to make the most out of those spent savings. I had counted down the days to what I was sure would be a once-in-a-lifetime trip all semester and all of Christmas break, and it was finally here. The apprehension hit me as it usually did: right before an event that I expected to bring change to my life. I had felt the same feeling in a variety of circumstances; my first cross country race, my first day of work, moving in to Bethel. It’s only in the days after arriving home from the trip, as I look back on that moment in the airport, that I realize that mixture of apprehension and anticipation was unique and more profound than any I had felt before. Like all the other times I had felt it, it represented an ushering in of change. But unlike the other times, the change took root in deeper areas of my life, and in a way that completely took me by surprise. I realized that true change was the result of a complete breaking of routine, a total evacuation of my comfort zone. Traveling across Europe and becoming intimately familiar with the conflict that shook the modern world a century ago ripped me from my routine in such a way that I know I came back changed. Beginning the trip in London got my feet wet, but I really began to plunge into deep historical empathy and personal change as we toured the Western Front. Viewing the sites where Nazism took root in Munich, and especially visiting Dachau had an unexpected spiritual impact that I will never forget. In the end, this trip was the once-in-a-lifetime experience I expected it to be but changed me in a way that I anything but expected. My immediate impression of London was that it was remarkably similar to New York City. The tube system, the language, and the immense size were all familiar; sometimes cars driving on the left side of the road were the only tip-off that I wasn’t in the United States. Because of the lack of a language barrier, navigation and making purchases was as simple as it was at home, leaving me securely in my comfort zone. Within everyday activities, there was little testing of my values, little stretching of my boundaries. Touring historical sites like the Tower of London intrigued me, and reminded me why I am passionate about studying history. I was enamored with the plethora of Egyptian, Assyrian, and Greek artifacts housed in the British Museum. I was fascinated with the long timeline laid out in the Museum of London. In particular, seeing the Roman wall standing amidst the bustle of the modern city boggled my mind; I couldn’t imagine everything that wall had stood witness to over millennia. While these sites were highlights of my time in London, and caused me to think more critically about how areas change over time, they mainly served to add to the novelty of travel, and did little to change me as a person. It was only as I toured the various Great War memorials scattered around London that I began to feel an empathetic reaction to the relics of the past that surrounded me. Seeing numerous displays of all those who gave their lives had a way of undoing the romantic perception of the past I had acquired through other historical sites. I was especially struck by the Australian memorial. Somehow, seeing the sheer number of places the Australian soldiers came from made the war seem realer and the sacrifice seem greater. While it seems that listing the soldiers’ names would be the most personal way to commemorate them, seeing all the hometowns listed was more intimate, calling to mind all the places husbands, fathers, and sons would never return, and the immense hardship those on the home front endured. 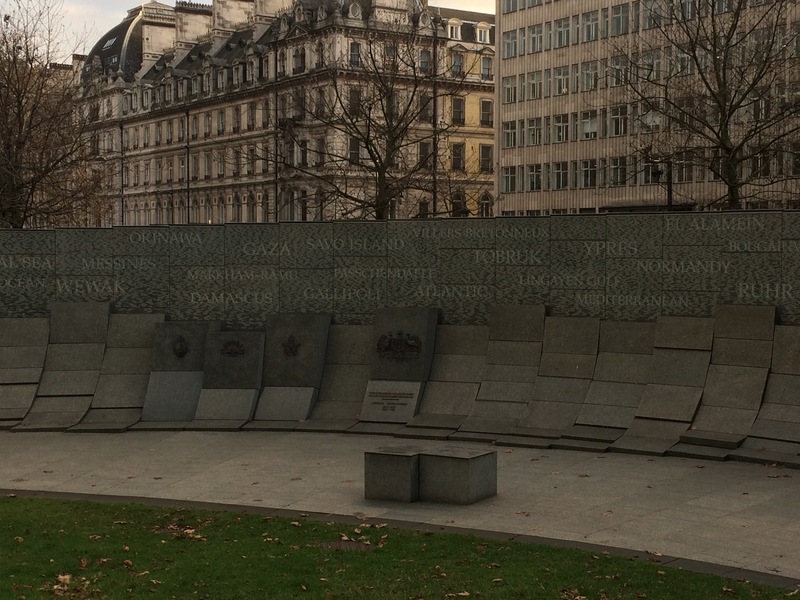 The memorials in London gave me a taste of the human side of the war, and began to complicate my understanding of conflict. As I prepared to leave London and write my first letter home I realized I had fallen into a routine. A routine of running, taking the Tube, visiting tourist destinations, to the point where I felt comfortable in this new city. It had become a place of constant excitement, and I realized that my feelings were at least somewhat similar to soldiers leaving England for the war a hundred years earlier. They were swept up in patriotic fervor just as I was swept up in the novelty of a new place, they rushed to the recruiting stations just as I rushed to historical sites, they boarded ships bound for the continent thrilled for adventure just as I boarded a train bound for the continent thrilled to explore. It wasn’t until I finally crossed the Channel and got on the move again that I began to sense a renewed testing of my values and perceptions. Though undoubtedly to a lesser extent than the soldiers, I was in for a more radical change than I thought possible. The first afternoon we spent on the Western Front was the first time I was able to visualize the devastation of the war. Visiting the dressing station where John McCrae penned “In Flanders Fields” and reading the poem where it was written brought the conflict to life in a way I had never experienced. Suddenly, I saw the war in a completely different way than the book I was reading at the time presented it. It was no longer a series of battles but a horrid mess of devastation. The death and destruction now had names attached instead of numbers. 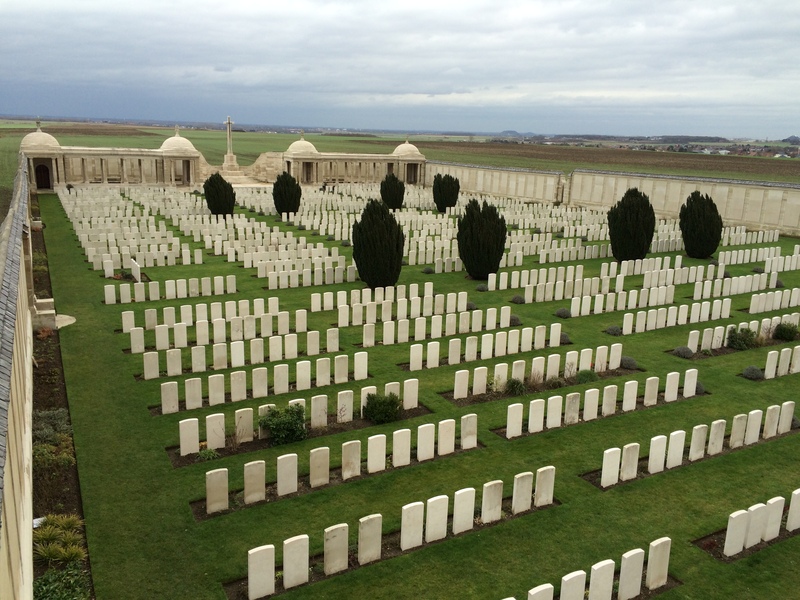 From then on, I viewed the war through a different lens; every one of the numerous headstones and each of the names listed on a memorial represented a life that experienced terrible conditions, trench warfare, and ultimately, premature death. It was sobering, to say the least. Like the memorials in London, viewing the actual sites of battles erased any traces of glorious perceptions of war I might have had left. I sat in the hostel that first night on the Front in a completely transformed mood compared to the day before. I felt like a young soldier thrilled for the adventure of war spending his first miserable night in a trench. Up until that point, I had felt very detached from the war, as I was separated from the soldiers by a wide gulf of time, space, culture, language and many other barriers. Walking in their footsteps forged a connection that would have been unachievable by merely reading books and names on memorials. Like the soldiers, I realized that the waging of war was anything but glorious. It was misery. As I reflected on that harsh reality that night, I struggled to reconcile the true colors of war with the perceptions I had brought with me from the US. I had always thought of war as an unfortunate but sometimes necessary aspect of life in the modern world. But seeing the utter destruction of not only a thriving modern society but so many young lives had me questioning all my preconceptions. Touring the Somme the next day reinforced my observations. Visiting the Newfoundland memorial and the former battlefield spread out in front of it was especially impactful. Land pockmarked with shell holes and the remains of trenches displayed the war in its full-fledged futility. It took around four and a half minutes to walk the distance that was gained by the British offensive in four and a half months. How could a supposedly modern society support such meaningless death? How could anyone twist this tragedy into glory? How can we be making progress when we’re slaughtering each other by the millions? Though I was hit hard by everything I saw along the Western Front, nothing struck a personal chord like the Ring of Remembrance at Notre Dame-de-Lorette. At every memorial, I had scoured the names, always unsurprised that no Brecheisen was printed. But as I gazed at this massive memorial where no distinction was made for rank or nationality, I picked out two who shared my last name. It was a profoundly shocking and sobering experience. I don’t recall ever seeing or hearing of anyone with the name outside of my immediate family, but here were two, a testament to the breadth and scale of the conflict. The Western Front had radically shifted my perceptions of war and erased my detachment from it. I knew I wouldn’t return home the same, yet there was more change still to come. I had always viewed Hitler and the Nazis as ‘evil,’ and attached that term to others throughout history, but considering the role of spiritual warfare in the past was unfamiliar and shocking. 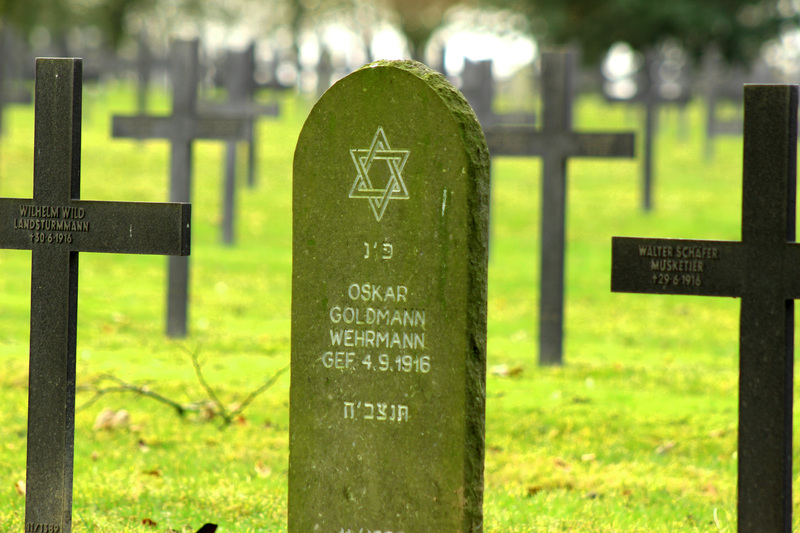 I experienced a complete shift in much of my thinking about evil in the world, and carried that perspective with me as we journeyed to Dachau a few days later. Stepping through the iron gate that read “Work Will Set You Free” and wandering through the former concentration camp within was indescribably challenging. Throughout the trip, even at sites on the Western Front where I had felt a sacred, vaguely spiritual connection, I had taken a myriad of pictures to remember my visit. Not at Dachau. I just felt as if I couldn’t, and I knew the mental images would last just as long. Something about walking in the footsteps of the 31,000 murdered there had a way of murdering the tourist inside of me. All I could do was wander through the various museum displays and vow to never forget the memory of those who suffered there. Though my time on the Western Front had caused me to question humanity and modern civilization, my time at Dachau took it to an entirely different level. To see the horrid atrocities humans were capable of, and then to realize Dachau was the tip of the iceberg, the model Nazi concentration camp, was thoroughly chilling. Despair washed over me as I considered the profound evil that surrounded me. Where could God possibly be in all of this? As I sat in the asymmetrical Protestant chapel on Dachau’s grounds, I remembered Jürgen Moltmann’s interpretation of such terrible evil and suffering. Moltmann posited that as we suffer, God suffers alongside us. Picturing Jesus being worked to the bone, tortured, mocked, alongside the rest of the prisoners was an image I will never forget. In that most unlikely of places, I felt God’s presence. I hadn’t felt it in the elaborate, stained-glass chapels of Westminster Abbey, or Notre Dame, or Sainte-Chapelle, or even the countless cemeteries of the Western Front; I had felt it in a simple chapel in a former concentration camp. I have always enjoyed traveling because it allows me to step outside of routine, to venture to a faraway place and gain a fresh perspective on day to day life. 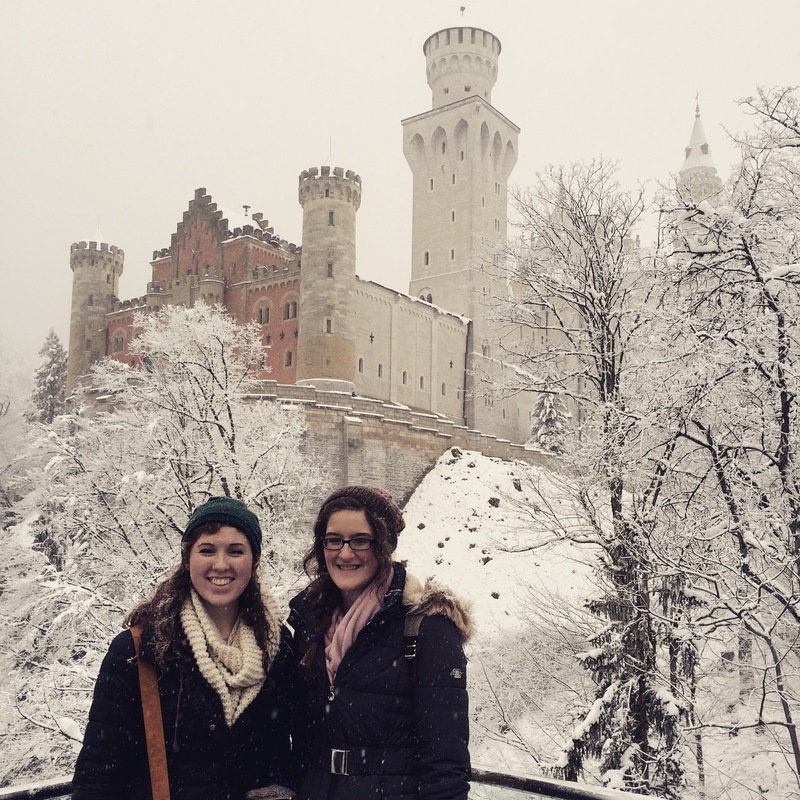 Returning from the bustle of London and Paris, the devastation of the Western Front, the realities of evil in Munich, and the suffering of Dachau changed me in a radically different way than travel had ever changed me before. J.R.R. Tolkien surely understood the depth of personal change one encounters after experiencing the devastation of the Western Front. Years later, he said, through Frodo Baggins: “There is no real going back. Though I may come to the Shire, it will not seem the same; for I shall not be the same.” When I returned home, walking Bethel’s campus again, I realized the truth of Frodo’s words. Experiencing the destruction of the First World War and the inhumanity of the Second not only transformed me, but also the world around me. I am extremely grateful for the opportunity to traverse through such life-changing places, and though I have returned home, I know there is no real going back. Author Chris GehrzPosted on March 17, 2016 Categories Courses, Events, News & Announcements, Study Abroad, World War ILeave a comment on Learn About Our January 2017 World War I Travel Course! To learn more about the five designs and the larger context of WWI commemoration, read “We Will Remember Them,” an essay by our own Prof. Chris Gehrz that was published last Friday by Books & Culture. At first glance, the phrase can seem rote, unnecessary. Surely a world war—fought by 65 million people and involving far more—cannot pass from the memory of anyone who experienced it, or heard about its glories and horrors second hand. Nor from the collective memory of a community broken, defined, or otherwise affected by it. And yet, we forget. Time marches forward, carrying our attention with it. The complicated riches of contemplating the past don’t stack up against the urgent needs of the present and the terrifying anxieties or tantalizing possibilities of the future. Students: if you’re interested in going on the January 2017 WWI trip, check back in March, when further details are announced. Ever Wanted to Design a WWI Memorial? Here’s Your Chance! Over 100,000 Americans died in World War I, yet it’s the one 20th century conflict not commemorated with a memorial on or near the National Mall in Washington, DC. But Congress has authorized a redesign of the memorial to American WWI commander John J. Pershing (a block from the White House), and the U.S. WWI Centennial Commission has opened the design competition to all comers will to pay the $100 fee! The memorial should honor and commemorate the service of American forces in World War I with sufficient scale and gravity that the memorial takes its place within the larger network of memorials and monuments situated on and around the National Mall. At the same time, designers should forge functional and perceptual linkages to the pathways, streets, and civic spaces and architectural landmarks around the site. Design and landscape elements should contribute to the park composition and strengthen the park’s relationship to the larger urban context, while complementing, and not detracting from, the meaning of the commemorative elements (whether new or pre-existing) within the site. …honor the heroism and valor of the American servicemen and women who served, fought, and died in World War I, and should commemorate the tragedy and magnitude of loss suffered by the United States in the conflict. …be timeless and meaningful for future generations, which can be achieved through appropriate interpretive elements including (but not limited to) figurative or other sculpture, traditional monument forms, and relevant quotations or other texts relating to American participation in World War I. The Memorial shall not list names of individual servicemen and women who served or were killed in World War I. …balance a sense of enclosure and dignity with openness and visibility that is inviting to passersby. You’ve got until July 21st to submit your entry. Need some ideas? Here are a few images of the WWI memorials that our students saw on the 2013 and 2015 iterations of the HIS230L travel course in Europe. Author Chris GehrzPosted on July 10, 2015 Categories Courses, Museums & Public History, News & Announcements, World War I1 Comment on Ever Wanted to Design a WWI Memorial? Here’s Your Chance! We conclude our two-week conversation on Christian approaches to history, with Profs. Kooistra and Gehrz discussing “providential history,” moral judgment and reflection, and what’s transformative (even “conversional”) about the study of the past. As the calendar turns to March, today we share one last post from our January travel course in Europe on the history of World War I: a second example of the memoirs that students wrote as their final assignment. This post comes to us from History major Angela Stephens ’16, who also contributed several beautiful images to our four-part photo essay. I volunteered. As soon as I heard about this trip, I found the recruiting office — Professor Gehrz’s office — and put my name on the list. I wanted to prove to myself and to others that I was truly British… I mean Bethel. I could not wait to get our trip details; I was leaving school to go learn of war. It was not until the Last Post in Belgium that I realized my emotional journey though the trip had been somewhat similar to what the soldiers of World War I experienced. I started off very excited, then I became disenchanted, angry, then I eventually came to terms with what I had seen and heard. We arrived in London after some exciting travel hiccups. The night we finally landed in our hostel, I was already fully in love with London. Something called me to it, something wild and lively. I felt comfortable walking the streets with my luggage at two in the morning. I was in a group of students that I did not know very well at all and I was actually more comfortable moving about alone through crowds and metro stations than with my peers. I believe this experience may have been similar what to brand new soldiers would have experienced. Before joining the military with many of your friends, soldiers probably did not know many of the men they were stationed with. I was in a foreign land, with foreign people, learning to be one. As our group toured the streets and major sites of London — Trafalgar Square, Westminster Abbey, and St Paul’s Cathedral — I felt a change in my attraction to London. There was something behind my admiration for it. A slight darkness, a small doubt, something lurking. I walked the streets of London alone, and often, at night. I was surrounded by loud life and bright lights, and yet, a silent darkness. After visiting museums, art galleries and monuments, this shadow of stillness grew. Something is only magical and mysterious if it can only be seen from a distance. Once up close, eye to eye, with war and the memories skulking through London, I was disenchanted. The glorification of man and machine was so apparent, it was suffocating. Where was God in all of this blood and metal? On one of my many rides on the Tube, a song came through my headphones and a line struck me and became my summation of London: “This city breathes the plague of loving things more than their creator.” London, plastered with fashion, metal and man, gave little notice to God. Oxford was a different story. This ancient-feeling city was sweet and comforting. Our tour guide, Alastair, probably had a hand in this. I was able to touch buildings that were almost four times older than the United States of America. This realization made me feel extremely small in the scope of time and space. This old city felt like a haven from the dry London. I imagine soldiers who came to the many hospitals in Oxford felt similarly. We passed lush green gardens, quiet, cool and soft. A welcoming embrace compared to London. Belgium resembled Oxford in soft deep greens, but it was dissimilar in atmosphere. There was a sorrow that had grown deep into the ground. Quiet, but ever present. Reality struck in Belgium, the front lines of battle, death. It was easier to find God in suffering and silence. Like Wilfred Owen, “I, too, saw God through mud,” though not the mud that cracked on cheeks; I saw God in the mud of the fields and hills, now rolling and beautiful. What Satan meant for evil, God meant it for good. Out of the mud, God brought fertile beauty. He brought production out of destruction. Paris was, at first, welcomed after the solemn trenches. It was as if we were on leave, allowed a distraction from the burdens we saw on the Western Front. Yet, it was a hollow comfort, which, in the end,was no comfort at all. Still, man and machine were glorified. The sight of beautiful buildings and magnificent structures comforted my eyes, but my mind still twisted with frustration and confusion. The Palace of Versailles had gardens that had no end, magnificent paintings and rooms for a select few honored guests to watch the king and his family eat dinner. This was tainted by the knowledge that while this line of kings ate lavish meals, Paris was a Band-Aid for a broken bone. Leaving Paris, we went to Germany, where my final and most influential realization occurred. Dachau was the end of my rope. I came to the limits of my faith in God’s goodness, or at least his power. Dachau was the product of a world that had lost sight of its creator. Man was so glorified that he was willing to place his brother on a scale. If that brother did not weigh enough, he was snuffed out. It was a place of death and absolute silence. I was so angry and once again, God spoke to me through a song. It is well with my soul. It is not! It is well with my soul. How could he allow this to happen to so many innocent people? It is well with my soul. Something inside broke. It was my anger. God is God even when I hate what man has done. He is God even when I could not see any goodness. He is good, he makes it well with my soul and he made it well with the people who suffered, and the people who caused the suffering. I had to let go of my confusion. I had to realize that faith can not be questioned, only lived. In the end, I came out alive, a little bruised, but still healthy. I heard once a sermon in which the preacher said “we can never fully trust God until we have wrestled with him.” I became Jacob. I wrestled and I have been blessed tremendously. This trip helped me see that, no matter how I feel, God sees, knows and feels infinitely more than I ever could. It also gave me a warning to watch what I am glorifying. I could end up putting myself in a spiritual Dachau, and probably being angry with God for allowing it. I experienced excitement, disillusion, sorrow, anger, that all wrapped into restoration. I hope many soldiers were able to come to the last, but this trip also helped me gain insight to what the soldiers were going through mentally. I had no fear of death, but I could comprehend what was going through their minds. 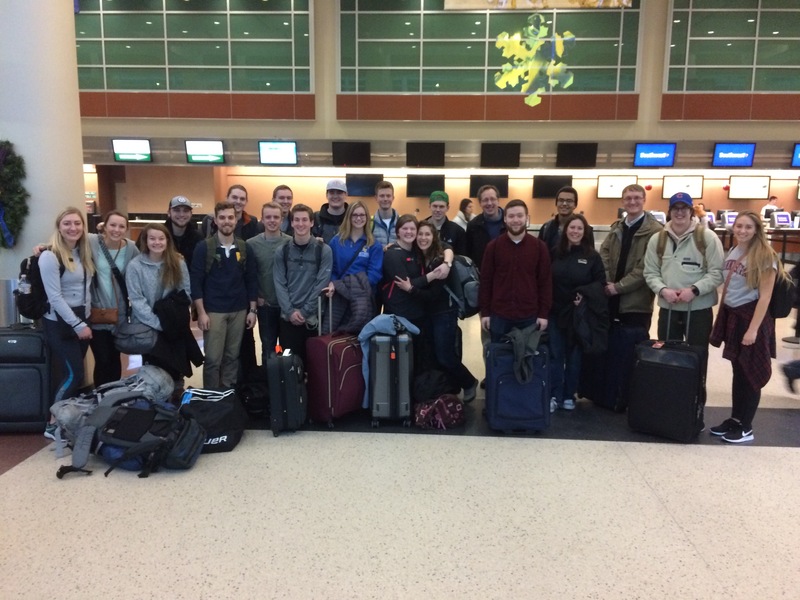 For the final assignment in HIS230L, our J-term travel course on the history of World War I, students wrote a memoir of their experience. We’ve asked two students for permission to share what they wrote, starting with this post from Lauren Gannon ’17. Lauren, who is adding a History minor to her studies in Media Production and Graphic Design, refers at several points to one of the most famous memoirs of the war, Vera Brittain’s Testament of Youth, excerpts of which students read throughout the trip. I sit in a coffee shop. The reading packet for the trip I am about to leave for in four days sits in front of me. The packet is open to the pages with the itinerary. The small table is cluttered with the reader, syllabus, coffee cup and the recently written notes for my site preview. A whisper of a smile is on my face as I read through the schedule for the first couple of days for the x-teenth time that day. In fact, that smile has been on my face for weeks. Excitement occupies my emotions with the exception of the anxiety and fear that sneak in every once in a while. Leaving my family and going on the trip of a lifetime with a group of students that I barely know causes a little anxiety, but mostly, I am prepared to change. I am excited as well as nervous for the challenges this change will bring, but I am ready for it. Or at least I thought I was. “Did you notice that that’s Big Ben right over there?” asked Anne-Britt as we stood in Trafalgar Square on our first full day in London. I looked down the road, and in a sun-kissed haze, I saw it. We were there! We were in a place that I had only dreamed about! My excitement was only heightened as our class began and my emotions seemed to match those of the people who celebrated Britain’s entrance into the war one hundred years earlier. Although it was a different kind of excitement, it was excitement. I found myself with seemingly boundless energy for the long walking tours and memorial visits that day. I was taking in as much as I could every second. This attitude continued throughout the week as I got to know my professors, their wives, and my fellow classmates. I really did feel like a soldier, but a soldier headed to a much better place than war, bonding with my commanding officers and fellow soldiers. We were all in this together. We were only a couple days into the trip when we went to the Imperial War Museum. That was the day that I experienced the reality of what we were there to learn about: war. Although we had seen memorials and monuments for those who fought in the Great War, I had yet to absorb all the knowledge I could about the war itself. The WWI exhibit in the museum was fantastically arranged. As I walked through, I could spend as much time as I needed learning about the different aspects of the war in an interactive way. I will never forget the moment that I heard the simulated gunshots and explosions coming from one of the displays and was completely terrified. The First World War in particular had always seemed so far removed for me, existing only in textbooks. Suddenly, here I was in a place that was deeply impacted by it and much closer physically to where the fighting actually occurred. How was I supposed to handle actually walking through preserved trenches when I was impacted so much by a display in a museum? I was not sure, but, yet again, I felt a connection to the soldiers. They left home excited to fight, only to be completely disillusioned by the horror that is war. I left home excited to learn and be changed, only to find myself unprepared for what that entailed. Free time helped to lessen the anxiety, but I could not help but feel anxious about the uncertainty of how the rest of the trip would affect me. After being in London for a week, we took our first day trip as a group to Oxford. Here was where I found my deepest connection. Vera Brittain was a student at Oxford when the war broke out. Her brother, fiancé and friends went to fight, and she was left behind. Although she had a place at an esteemed university, which was rare for a woman in this time, she left to become an army nurse and be a part of the event that would define her generation. Although I was finding some connection to soldiers during the war, I felt the strongest connection to Vera Brittain. Her situation, her interests, her temperament, all reminded me of myself. We read a lot of excerpts from her in our reading packet, and as I read those, I found myself nodding and understanding exactly what she was saying and why she was saying it. Her recollections of the women she attended college with and their intentions reminded me of my own university in a lot of ways. I was frustrated by a lot of the same things she was and sympathized with her desire to do more than stay behind and learn while she could be a part of something bigger. Brittain’s writings and life story would shape how I viewed the war for the rest of the trip. By the end of our time in London, my expectations for the trip had already been shattered. Overall, I was not finding the connections or changing as I had expected. I wrote in my journal my only solution: “be as close as possible.” I was learning that I could only expect to get so close before I expected to travel through time to actually be there. What I was experiencing would have to be enough, and it would be as long as I was striving to get as close as possible. After my realization in London that I would not be actually living WWI, the Western Front became more of a study of remembrance rather than a study of the actual war. I learned about the battles and strategies from Carl and Lucas [our local guides], but the one thing that Carl said that I do not think I will ever forget is that “every headstone, each name has a story.” As we walked through cemeteries and visited memorials, the massive number of names and headstones struck me. So many people died in a war that was supposed to be quick and relatively easy. How do we remember them? We put their names on memorials and maintain cemeteries. Even those who were unidentifiable after they died had a place to be remembered. Not only are they remembered there, but also they are remembered by anyone who visits. I visited and I know that I will remember them. That is how I can be connected. I can remember my personal experience with where they live on for all to see. “Dud Corner”: one of the hundreds of British cemeteries in Belgium and northern France. Its most famous name is that of Jack Kipling, ill-fated son of the poet Rudyard Kipling. Again, I was impacted in an unexpected way. I was faced with the actual terrain on which many soldiers died and are still being found, but it did not feel that way. Although after London I was expecting to feel like this, I was still disappointed. I felt farther removed than I had been in London and I did not know why. Why was I finding it so difficult to feel empathetic to the soldiers’ experiences? I still did not know. Vera Brittain puts into words how I felt on the Front when she says, “on the whole it seemed safer to go on being a machine.” I felt as though I had no other choice if I was not satisfied with my reactions than to continue in the same manner, to go through the motions and hope that something changes. Paris was surreal at first. After such long and tiring days, we were in the city of love and lights and I was only a little bit excited. In fact, I think I was mostly relieved. The exhaustion of the trip must have been getting to me because I felt weary and discouraged, but was ready to begin another leg of the journey. It was not until the expats tour that I felt excited and encouraged again. Paris has a knack for feeling timeless, so as we travelled through the streets and visited the cafés and restaurants that Ernest Hemingway and F. Scott Fitzgerald frequented, I felt as though they might as well have been there yesterday. My connection was back. It was affirmed when I went to the Shakespeare & Company bookstore and bought a copy of A Moveable Feast by Ernest Hemingway that had a picture of him in front of the store on the cover. I felt my energy return and my excitement rise. I was encouraged. Again, it was not what I expected, but I was not about to complain. Our time in Paris came and went so quickly that it felt as though I had blinked and we were departing to our last stop of the trip: Munich. Munich brought some anxiety to my experience. 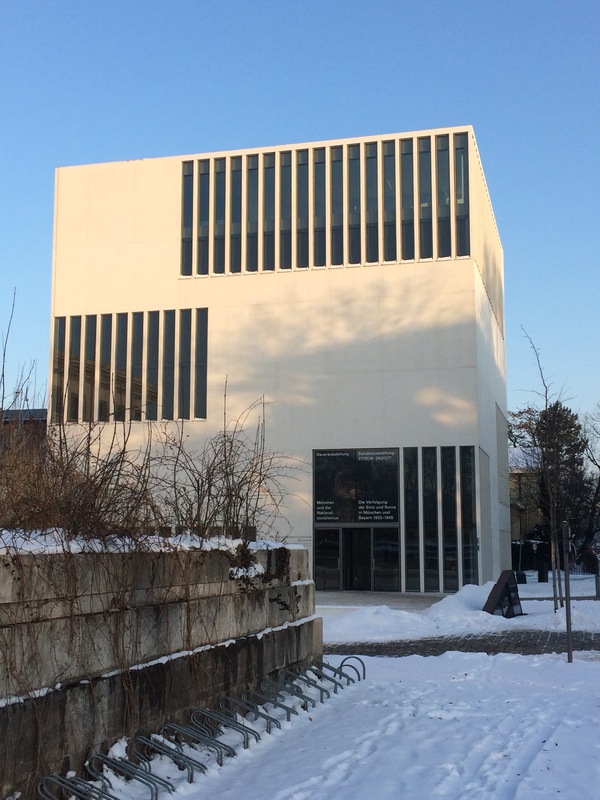 The modern urban feel of Munich was unsettling considering all that occurred there after the war, like the rise of Nazism. All that stood to remind those in Munich was a monument laid into the land in front of an official building that featured a sleeping soldier. However, I found this memorial to be the most memorable because it was different from everything else we had seen in London, Belgium and France. It gave a message of hopeful return. Germany was not defeated after World War I; they would rise again. Being in Munich was eerie when we discussed Hitler and Nazism. I found it interesting that such a beautiful place would have been a home to such horrifying ideals. Then just outside of Munich silently sits Dachau, the manifestation of these ideals. The day we went to Dachau was the day that I had been most nervous about. Before we went in, Sam said, “Let yourself be affected by it.” As much as I took those words to heart, I think that I unintentionally put up a wall. I was affected to an extent, but again, not to the extent that I was expecting or hoping. I found myself just walking through the yards and paths, thinking. What I thought about, I’m not exactly sure. All I know is that I walked from one place to another just thinking. It was heavy, that much I remember, and I do not handle heavy very well. My connection to that place, besides this trip, is one that I hope I never find. I think that Dachau affected me in a way that I will learn as I grow and learn. I hope to one day understand exactly what I was thinking about in reaction to what I saw, but I do not think that that day will come soon. I sit in a coffee shop. My notebook in front of me, my pencil in my hand, and all of my notes and reflections scattered across the table with my whisper of a smile on my face. I work through frustration and confusion before I realize the roots of it. Who am I? Who am I in history? How do I connect to the big picture? What is my responsibility when it comes to the experiences I have had and the knowledge I have acquired? Who am I? I’m not sure that I will ever know the perfect answers to all of those questions, but what I do know is that I am me and only I am me. No one else has had the exact experiences that I have had. So, nobody will be able to understand exactly what I have lived or how I have experienced the world, just like I will never know exactly what a soldier in WWI lived or how Vera Brittain experienced the world. However, I do know what I experienced, felt, and learned, and I am willing to share that with anyone wanting to know. What is my responsibility? My responsibility is to live, remember, and share my experiences because that is all I have and know for sure. It’s all anyone has. I have my own portion in the big picture and it’s my responsibility to paint it. If I don’t, who else will? In January of 1997 I took the J-term WWI class, taught by Professors Neil and Virginia Lettinga at Bethel College. (It was still ‘college’ back then.) I knew this class was different from most when ten minutes in we were marching and bellowing “It’s a Long Way to Tipperary.” It quickly became one of my favorite classes I had at Bethel. But more than the overall knowledge I gained about WWI, the class also helped shape the way I felt about duty, war, nationalism, and what my response to those ideas as a Christian should be. Eighteen years after taking the class for the first time, I was able to accompany the WWI class to Europe. I wondered what I would remember from my college class, what new things I would learn, and what differences I would experience. I quickly realized what a difference seeing the places, monuments, and graves would have on my overall sense of WWI. 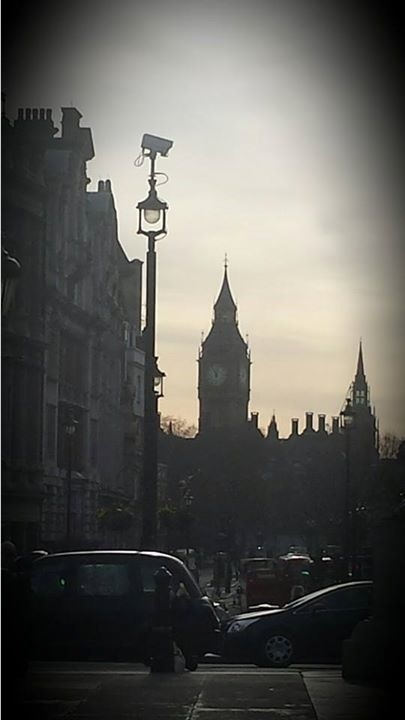 The first day in London, students had a scavenger hunt that led them to Trafalgar Square. As we gathered, we were asked to read a firsthand account of the declaration of war, which described the gathering throng of pro-war supporters at Trafalgar Square. Standing there visualizing this event, I was struck with an understanding I did not have previously. Even though in my college class experience we explored the reasons why people wanted to go to war, I still found the lust for war dumbfounding. I kept thinking I would be smarter that these people to get suckered into such a bloody conflict. I’m not sure if this is mostly the result of age, or how much of it was simply standing in that very square, but I finally understood why many felt the way they did. This happened over and over again throughout the trip. My previous knowledge and understanding of WWI constantly expanded, especially in empathetic and emotional ways. There were differences between the abroad experience and the classroom. 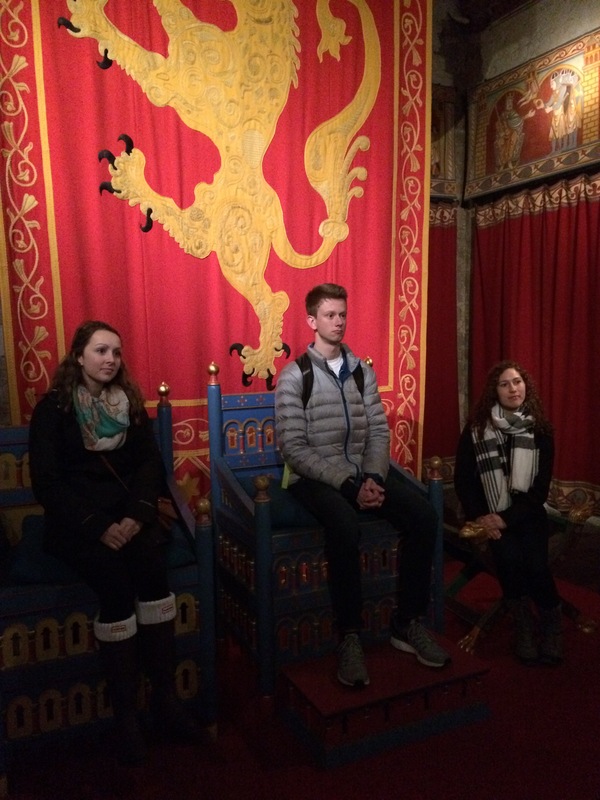 The abroad class focused primarily on the European experience of the War, specifically the Western Front, whereas the traditional classroom experience was able to spend more time on America, the Eastern Front, and other parts of the world during the war. Another difference was the ability to draw in other references. For example, in the classroom experience we had about 30 different slides (yes, they were slides!) of art that were chosen from all over the world to help us understand the intellectual and philosophical shift during this time. In the abroad experience we went to several art galleries to actually see first hand some of the same pieces and additional pieces from the era. Both experiences I gained a better understanding about the art and intellectual world from this era, but the experience was very different. I went mostly because it meant getting to travel to Europe. I have visited London and Paris in the past, and loved both cities. Having taken WWI before, I knew I would enjoy seeing firsthand some of the things I remembered seeing and reading about. I did not enter into this experience expecting something life-changing, but that is what I got! A major theme of the class was remembrance. 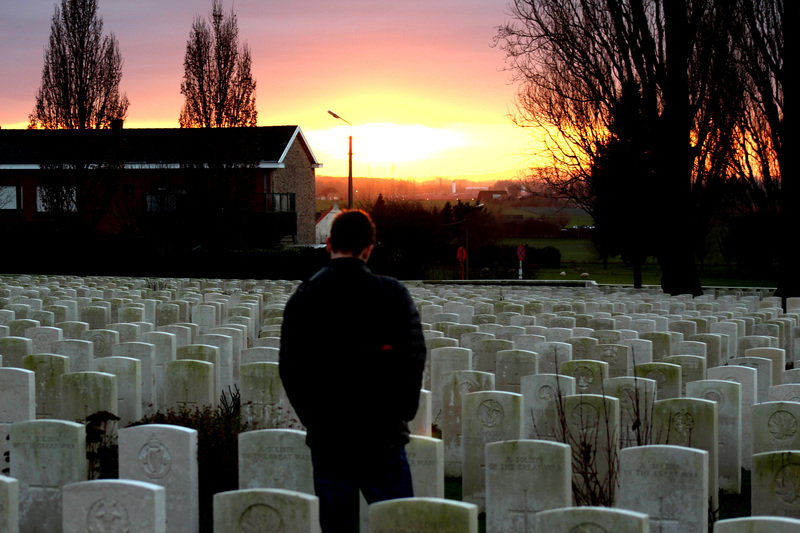 As we walked through cemeteries and past memorials in England, Belgium and France, we were asked to think about what we choose to remember in our culture and how we remember it. This led me to think about how I choose to remember events and people in my life, and in my world. The experience also made me contemplate my choices and my courage to live out my convictions as a Christian in our world. I am still contemplating lingering questions and convictions this experience had me wrestle with. I was also surprised to discover how emotional the war became for me. Whether it was in an art gallery, on a busy street looking at a monument, walking through a trench, or in a cemetery viewing row after row after row of nameless graves, I was often overcome with a new sense of the enormity and the impact the war had on so many lives. My favorite thing that I experienced in terms of the class was the three days in Belgium and northern France, where we spent time traveling to memorials, monuments, battlefields, and cemeteries. Contemplating memorials from Canada, South Africa, Wales, America, Australia, France, and many other nations as well as seeing graves of men from places like Germany, China, and India was an amazing, sometimes overwhelming experience. I was able to truly appreciate how indeed the world was consumed with this war. Also, being able to see the devastation and change of the land 100 years after the war was jaw dropping. Viewing the craters, bunkers, and trenches that are still part of the Belgium landscape is rather indescribable. There was one experience in particular where we walked up a hill in Belgium to a serene, beautiful wooded pond. The sun was setting in the distance, and there was a perfect, still image of the surrounding trees, brilliant sky, and birds in the reflection of the pond. As we sat there as a class, wondering why we were there, our tour guide explained that the land we were standing on and the pond was created by the Allied forces mining under the hill and blowing up the top where German forces were positioned. We sat there a while struck with the beauty and knowing the violence and death that created it. The other thing I most enjoyed and was surprised at was the wonderful relationships I was able to form with the class. Being the wife of one of the leaders, I wondered if I would be able to really get to know the students. I soon discovered that our experiences together helped form a close bond. Even though there was free time spent apart, there was a lot of time spent together exploring the city, traveling, eating meals, playing games, and talking at our hostel. The relationships that we formed there have continued here and I am so thankful for them.